Randomness with Rachel: A Blog Award and Five Question Friday! My good friend Katie over at Words by Katie presented me with a blog award. Thanks friend!! 3. When I get married, I want to leave the reception in a DeLorean. 4. I didn't learn to swim until I was 10. 5. My favorite clothing store is Old Navy. It's another Friday that I'm very happy to see! 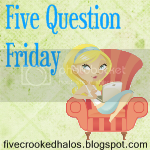 For more Five Question Friday answers, go check out Mama M. at My Little Life! Only TWO? You know me, I'm picky, but if I had to pick two, I would say guacamole (gag) and pasta salad. Now, I LOVE pasta. HOT COOKED pasta. The whole cold pasta thing doesn't fly with me! Blek! I really hope I don't lose friends/followers by saying this, but here I go: I don't like Girl Scout Cookies. Now, to be fair, I don't really like many cookies (except my mom's homemade peanut butter cookies). So no, I don't buy any. No, I don't even like Thin Mints (is now a good time to mention I don't like chocolate and mint mixed together)? Go make a new friend at For the Love of Blogs! Pasta salad..... way to make me gag just by mentioning it! Okay, I think it's either the DeLorean thing or the swimming thing. But the fact that you know how to spell DeLorean makes me think it's that one. If that's true, where will you find one? I'm with you on the stick shift too. And I don't know which of these is true. It seems like they all could be...but I just don't know. Maybe the swimming thing? Congrats! I love how you handle awards, I may do the same thing. :) Have a wonderful weekend my friend! If you want to leave your wedding in the DeLorean, make sure the flux capacitor is working correctly or your honeymoon in the future and/or past will be a wreck!! I think the 'odd man out' is the DeLorean one. I found you through Freckles and Fudge. 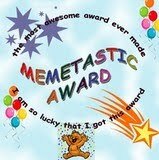 Congrats on your award. Your blog is a ray of sunshine! I drive a stick shift everyday and get MAJOR anxiety when I am on a slope of any kind- it is quite funny... to other people! 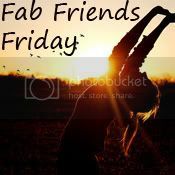 So happy to be catching up on your blog and hope you are having a FANTASTIC weekend, friend! I vote for the DeLorean. :) Haha. That would be awesome! ps--I have a funny story about a Delorean that I'll have to tell you sometime.